If we hadn’t been so annoyed from the effort it took to find this place, we would’ve definitely had a better overall experience. All of us managed to get lost. It could be that there are several hotels with very similar names (there are), and it could be that there are no clear road maps scoping this nook of Kowloon (there aren’t), or maybe it’s the poor design of the complex, where the entrance is hidden on a back street with zero vehicular access. We’re betting on the latter more than anything. For a complex that bills itself as having glamorous harbour views, it’s also surprising they’ve chosen to stick their premiere dining hall in front of the parking lot, and not the harbour. So, with a great view of the parking lot – and not the twinkling lights of Victoria beyond – we began our meal. Inside, family-sized tables stood forlornly empty, while all the two and four tops were full. The space is underutilised, and gives off a sense of emptiness. Meanwhile, a curtain closes off one side of the room – the side that has the best view, naturally. Not exactly the most promising start; but what of the food? The chef’s specialty is the double-boiled chicken and fish maw soup with Shanghai wontons ($168). The made-to-order pork dumplings were amazingly slippery and fresh; the boy choy was slightly cooked with a bit of crunch left to the bite; and the soup silky and delicious. Then a plate of pulled chicken, which the broth is made from, came to the table with soy dipping sauce – this dish is a meal in itself. A large platter of deep fried Mandarin fish ($238) arrived next. The fish had been scored in a way that it resembled live coral. This was done for two reasons: 1) to provide increased surface area to hold the batter and sweet and sour sauce; 2) to make a small fish appear twice as large as it actually is. 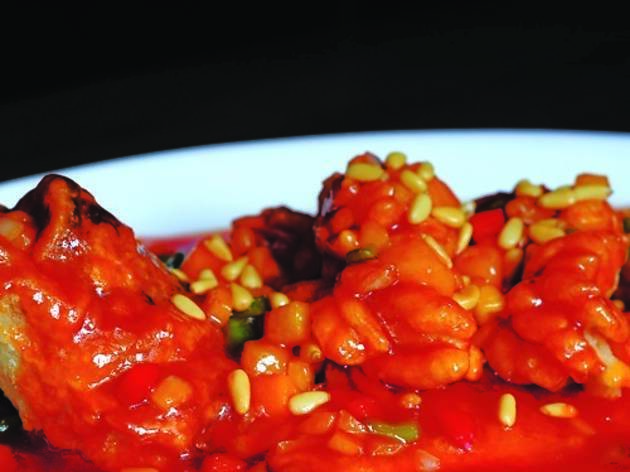 We happily polished off the dish, with its pine nut-dotted sauce that was more sweet than sour. Three more dishes then arrived at once. The Shanghai cabbage with Yunnan ham and bean curd sheets ($75) was light and healthy, but could have used another wash as we found dirt in the leaves; the Shanghai noodles with shredded pork and cabbage ($68) were greasy and wonderful, but needed vinegar and soy to pronounce the flavours of the pork and vegetables; and the pan-fried dumplings (three for $30) were juicy and savoury. 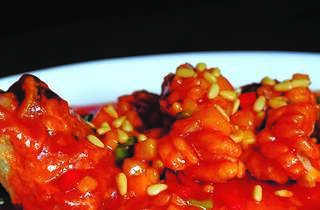 All three were well-made staples of classic Shanghainese cooking. Undoubtedly, the place has potential, especially in the stellar kitchen and the over-friendly staff, but the other elements needs to come together for all of it to work. For starters, a view would be nice.